Perhaps the most important observation about this chapter is that Greek mythology and legend existed in no fixed canon. Each community told stories with myriad variations of theme and character. All have been influential in the Western tradition, but a few should be singled out: Hero and Leander, Atalanta and Milanion, Baucis and Philemon, and Pyramus and Thisbe. Hero and Leander. 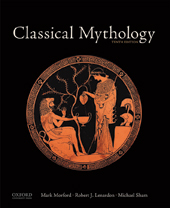 The stories of Cyparissus, Anaxarete, and Iphis (child of Ligdus) are related in Ovid’s Metamorphoses, while those of Cydippe and of Hero are told in his Heroides. Of these, the legend of Hero and Leander has been especially popular with poets and artists in all ages: the story was told by the late Greek poet Musaeus (ca. 500 A.D.), and his poem was imitated by Bernardo Tasso (1537) and Christopher Marlowe (1593), whose version was completed by George Chapman (1616). The legend inspired a large number of musical works and poems in the 19th century, while Byron was moved by it to swim from Sestos to Abydos in 1810 and to write a poem on his feat. Atalanta. The race between Atalanta and Milanion (Hippomenes) has been popular, especially in the nineteenth century (e.g., the poem “Atalanta’s Race,” by William Morris, 1864, illustrated by Edward Burne Jones). The race and the metamorphosis of the lovers into lions are narrated in Book 10 of Ovid’s Metamorphoses. But they are also said to be the parents of the Argive hero, Parthenopaeus, one of the Seven against Thebes (see MLS, Chapter 17): hence the device of a boar on his shield in Euripides’ Phoenissae (411 B.C.). Euripides also wrote a tragedy, Meleager (416 B.C. ), which dealt with the Meleager’s love for Atalanta and his death. Baucis and Philemon. One of Ovid’s most famous stories in the Metamorphoses is that of Baucis and Philemon (Book 8). Ovid uses the poor couple as an example of piety rewarded, and their story was especially popular. The story was given a strong moral bias by Nathaniel Hawthorne in “The Miraculous Pitcher,” one of the tales in A Wonder Book (1851). A bitter interpretation is given by Graham Hough in his poem, “The Heavenly Visitors” (1961), in which the gods, “aglow with high Olympian charity,” by selfish munificence turn the pious couple’s simple life upside down. Pyramus and Thisbe. Ovid says that his tale of Pyramus and Thisbe is “not well known,” but thanks to him it has become one of the best known of all his tales (Book 4 of the Metamorphoses). Among the many poets who have narrated it are Petrarch (1340), Boccaccio (1343), Chaucer (1386, in The Legende of Goode Women). Best known of all is Shakespeare’s double use of it in A Midsummer Night’s Dream (1596), where the main plot follows the legend with its lovers’ errors and meetings outside the city, while the “Rude Mechanicals” of Act 5 have endeared their hilarious version to audiences in all ages.